Photo by Emina Causevic | The State Press Theatre student Evan Carson performs "Games We Play" at Binary Theatre on March 16, 2017. "What you're going through is normal." "It's a phase." "Get over it." For any of us who have tried to discuss our depression or mental health, these are just some of the responses we often hear. We've been raised to believe that we can simply "get over" our depression after experiencing something traumatic. The stigma surrounding mental illness causes many people who do suffer from mental illness to feel as though they're ignored or deemed "sensitive" by their family and friends. However, in recent years, notably on social media, more people have been talking about mental health as a serious issue. But outside of the internet, how do we discuss mental health as a community? Art, particularly theater, is a great way to talk about it. Theater is all about community, so to have dialogue and represent characters with mental issues that other members in our community can relate to helps to lower the stigma and encourage people who do suffer from mental illness to get help. Students can look no further than the ASU campus this semester to find theater that brings mental well-being and dealing with trauma to the forefront. 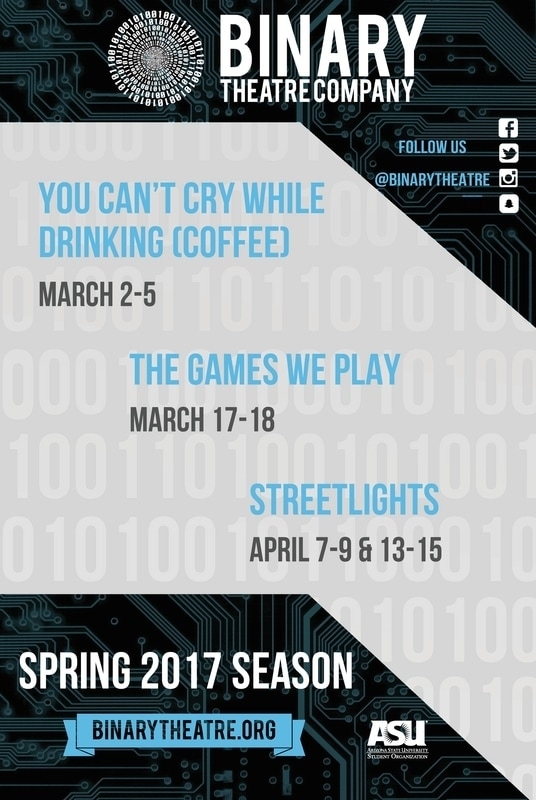 Specifically, Binary Theatre Company, a student-run theatre organization at ASU, is featuring plays written by undergraduate students. All three plays for their spring 2017 season relate to each other on the theme of mental well-being, depression and trauma. "When people started pitching their ideas and scripts for shows back in November, December, before the spring semester, the board saw that almost all the shows were dealing with loss, trauma, they were autobiographical, and they dealt with themes of mental health," said Evan Carson, a senior theater major and vice president of Binary. Carson wrote and performed a one-man show, "Games We Play," on March 17 and 18. Carson said his show was about, "how video games are prevalent at different parts of my life. But mainly, how they are prevalent at different traumatic parts of my life." Carson's show was not directly about mental health, however his show dealt with loss, depression and touched upon substance abuse — topics all very much in the realm of mental health. It appears that Binary has chosen the perfect time to discuss mental health due to our current social climate. Carson said it was the right time to talk about mental illness in regards to healthcare, so people can "hear stories that might be similar to theirs." Both Tess Galbiati's show, "You Can't Cry While Drinking (Coffee)," and "Games We Play" dealt with loss and depression; — yet both utilized comedy to help tell the story. In life we need comedy to help get through tragedy. We also must not be afraid to laugh after experiencing something traumatic. A part in "Games We Play" that really stuck with me after watching the show is when Carson explains that after tragedy, there's never really a normalcy one can return to again. At least, one cannot return to the exact same normalcy before a tragedy occurred. As someone who has dealt with trauma in my life, I knew exactly what he was talking about. I'm sure everyone in the audience who has dealt with trauma related to the part. Many plays have tragedies — case in point, Shakespeare. Don't get me wrong, I love Shakespeare, but not many plays discuss what happens after tragedy. How do characters attain some form of normalcy after their whole world has been turned upside-down? Many plays do touch upon depression, but not many plays have depression as a major theme. It's great that Binary is shining a light on characters dealing with depression. Up next in for Binary is their third and final show of the season, 'Streetlights.' The work deals with mental health and suicide. In some ways, when audience members see characters that are going through similar traumatic experiences that they can relate to, it encourages them to not only seek help but also realize that they are not alone. Art is always a reflection of real life. The more that theater represents characters enduring the aftermath of trauma, the less a stigma against mental health will exist. The more theater and art demonstrate how depression and other mental illnesses are problems many people face, the more we can destimgatize and regard mental health as a real problem. More info about Binary can be found at its website. Information about on-campus counseling can be found here.